The Aiphone TouchScreen Series features a large 7-inch touchscreen monitor for clear visitor identification and easy operation control. 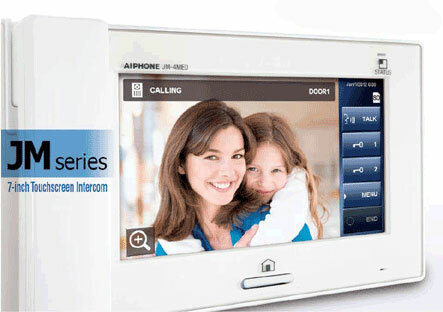 The TouchScreen Series can be installed at 4 door locations and connected to 8 inside locations with internal communication between stations. The sleek and modern design of the TouchScreen Series master station complements today's homes and lifestyles. In addition, the TouchScreen Series comes equipped with three alarm inputs. These can be used to alert tenants of potential threats, emergencies, or home damage.